Yesterday, Apple released an update to its iPhone/iPad operating system, iOS 5, alongside its new backup/syncing/interweb thing, iCloud. iOS 5 is beautiful. You can read a complete list of new stuff elsewhere, but some of the new features really improve the devices that iOS powers. Notifications were a useless mess before, but now they’re unobtrusive and easily accessible. Syncing without wires is similarly long overdue; now we just need wireless power and rat’s nests of cables will be a thing of the past. The split keyboard on the iPad is a nice option, but will take getting used to. Another iPad feature that nobody is talking about, for some reason, is multitasking gestures. Having to double-click the home button just to switch apps was getting pretty ridiculous. Now clawing at it with four fingers will do the trick. 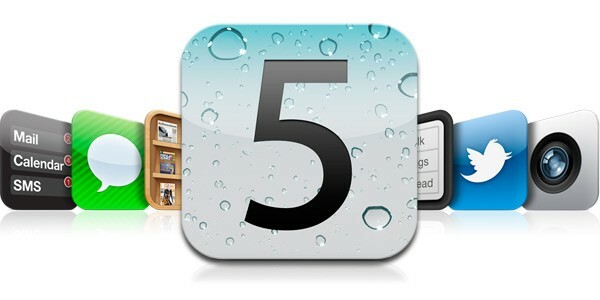 The iPad and iPhone are much better devices with iOS 5. Unfortunately, I’m less impressed by Apple’s attempts to extend these devices to the cloud. The promise of iCloud is amazing. You can update something on one device—add a contact, or work on an iWork document, or take a picture, or start a conversation, or buy a song—and it will automagically appear on all your devices. For some things, this works beautifully. I cleaned up my contacts on my MacBook today, and without doing anything else, or even plugging anything in, they’re cleaned up on my iPad, iPhone, and on iCloud.com. For other things, there are seemingly small issues that end up being dealbreakers. One new feature is that all photos are automatically published everywhere, viewable on any device with Photo Stream. While mildly creepy, I’m fine with that after I opt in for it. What’s not fine is being unable to delete any photos after you take them. Seriously. If you accidentally (or purposefully) take a crappy photo, it will be on every device forever. You can turn off Photo Stream and delete every photo, but you can’t delete just that one photo that was meant to be texted then discarded. This is so ridiculous that it’s almost as if they released iCloud without it by accident. I’m guessing it’ll be fixed pretty soon, but it’s dumb to have left it out initially. Maybe Apple’s just waiting for a scandal to drum up free advertising. iMessage isn’t technically part of iCloud, but it’s sending messages over the internet, so maybe it should be. 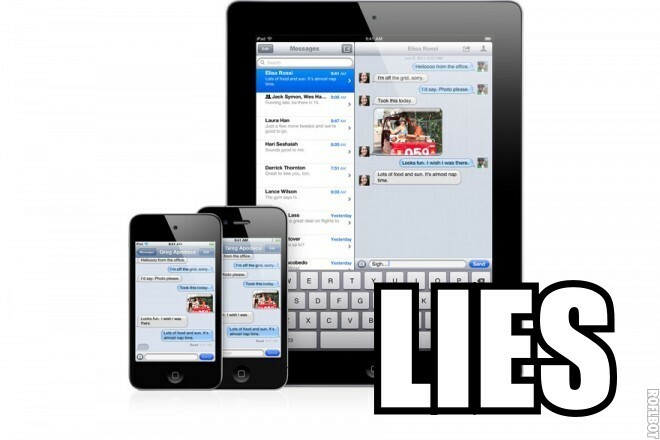 iMessage mysteriously detects whether the person you’re texting has an iOS device, and if so, sends them a message via data rather than text messaging. It’s very cool if you don’t have an unlimited texting plan, or drop out of cell phone coverage a lot. Even cooler is that it works on the iPad and iPod touch as well, so you can finally text from them. Since they don’t have phone numbers, you set up an email address to iMessage with. There is also the promise of being able to start a conversation on one device, but continue it on whatever other device you switch to. Where it fails is that, from what I’ve seen so far, it doesn’t deliver on that promise. iMessage doesn’t associate your phone number with your email address(es), so if you’re texting between phone numbers on an iPhone, then switch to an iPad, now you need to start a new conversation using the email address you set up on the iPad. You could use the email address the whole time, but that defeats the purpose of making it a texting alternative; coordinating this with people will be almost as bad as having to exchange PINs on BlackBerrys. This messy confusion sinks what was supposed to be a simplification of messaging. Update Oct 15: I’ve managed to unify all my messages, at least with one person. It took some combination of the following: both of us added all of each other’s iMessage phone numbers and email addresses to the same contact. We also made sure our “caller ID” (which has nothing to do with calling) in the message settings was the same on all of our devices (i.e., on an iPhone, it has to be changed to an email address instead of a phone number). Now, all communications show up in the same conversation, which syncs across all devices, just as promised. It’s even smart enough to know that if you see the conversation on your unlocked iPad, it doesn’t need to bother alerting you on your iPhone too. Cool. So it’s possible to achieve the promise of iMessage, but it takes a lot of fiddling and coordination between the two people, and it’s still not really clear how to do it. I’m wondering why more people aren’t complaining about this next problem. I think most early reviewers just assumed this wouldn’t be a problem, and didn’t actually try it. The aspect of iCloud I was most excited about is the ability to work on a document from any device, and have it always be synced up between devices, automatically. Currently, this works wonderfully for syncing a document between iOS devices. So, you can type up something on your iPad, and it will automatically show up on your…uh…iPhone I guess? But why the hell would you want to do word processing on an iPhone? Yeah. There is no way to have iCloud sync documents with an actual computer. It syncs photos and contacts just fine with OSX, but nooo, creating documents, the one thing that’s still done best with a large screen and a keyboard, you can’t do that on a computer. I’m sure this feature is coming, but I’m baffled as to why this, what I think is the most useful application of iCloud, wasn’t a priority to get out right away. As it is, iCloud is nothing more than an automatic backup for iWork documents. I don’t wanna get into #firstworldproblem territory by complaining about nitpicky details in the OS of a supercomputer that I can carry around in my pocket. But still, these are some odd omissions among software that is so improved in every other way. I didn’t see these problems addressed elsewhere, so I thought I’d get this up on the internet for other complainers to find. It’ll probably all be fixed tomorrow, and then I’ll be back to blissful Apple fanboyism.